The weather in Paris has been unusually hot and sunny lately. How do I know this? I will be spending the summer in this lovely city and blogging for The Flower Pot from here. One of the best aspects of Parisian life are all the great open markets where you can find all the staples of French nutrition: cheese, bread, wine, fruit. An integral aspect of the market are the flowers that are sold: there are so many, and so many different kinds, it creates a beautiful carpet of colours you get to choose your bouquet from, and the florist will always have good advice and friendly conversation. Whatever you do, don't forget to say "Bonjour"! It's not at all unusual here to find people buying their groceries for the week along with a bouquet of flowers to brighten their kitchen while they cook. Flowers have their own important place in the fabric of Parisian lives. Generally, Europeans are very private people and don't easily invite people into their homes. If you are fortunate enough to get an invitation, be sure to bring a bouquet of flowers for your host! 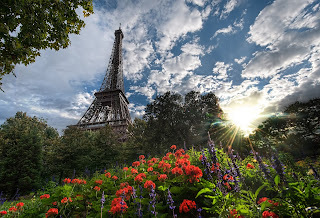 For us here at The Flower Pot, flowers are obviously very important, and we have a few floral offerings that were inspired by Paris and its relationship to flowers. Watery Bouquet is a European style bouquet in water filled with beautiful lisianthus', gerberas, hypericums and roses. Not only does this style of bouquet last much longer because of its water bubble, but the natural quality of this particular arrangement makes it the perfect choice to decorate your kitchen: not too fancy, but always beautiful. My next stop is the Chateau de Versailles where I'll be visiting the wonderful French gardens. Here symmetry and geometric shapes are all the rage. Hedges are grown in geometric patterns around fountains and trees are sculpted into various forms and shapes. For example, the trees behind Notre Dame de Paris have been shaped into rows of perfect squares! While I'm off gallivanting abroad, my colleagues at The Flower Pot are always available should you need floral advice or gift ideas. Call them, 514-938-1234, or stop by for a chat in our cosy Griffintown shop.